The Easytrack is a pressure fit system requiring no permanent installation. The Easytrack is a versatile solution for all types of point-to-point transfers - wheelchair to bed, bed to chair, even in the bathroom, anywhere there is a lift and transfer need. The Easytrack has a safe working load capacity of 440 lbs. (200 kg.). That is exceptional for a portable product making it suitable for Homecare use. This equipment was designed to allow patient with a mobility impairment to continue to live at home and enjoy normal activities. Please note: Slings are required for use with the EasyTrack FS™. Please refer to transfer slings. 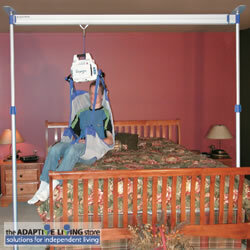 Please note: EasyTrack is designed to be utilized only with ArjoHuntleigh Homecare Division Portable Ceiling Lift Units. Please refer to portable ceiling lift units or kits.